The Chama Peak Land Alliance is a diverse group of conservation-minded landowners committed to embracing and practicing responsible land, water and wildlife stewardship in southern Colorado and northern New Mexico for the benefit of our tri-cultural heritage and for generations to come. 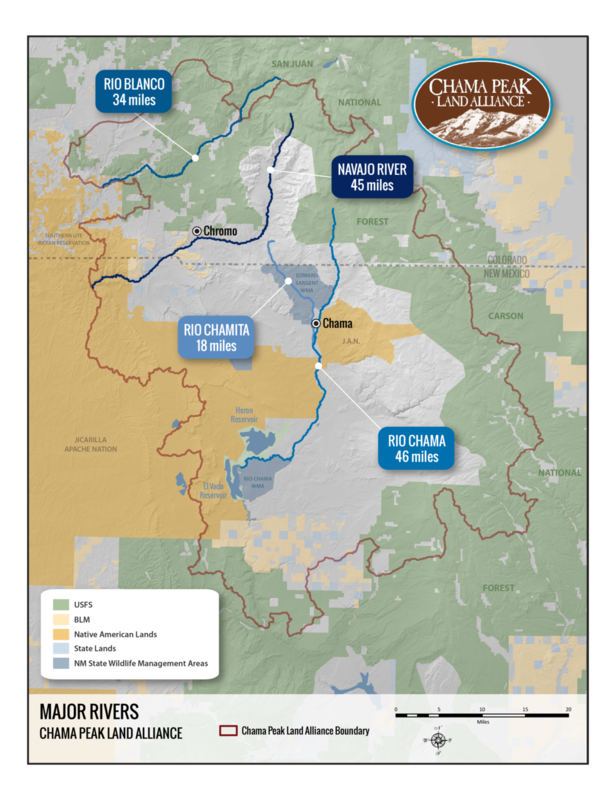 Members of the Alliance represent a land area that runs from the headwaters of the Navajo River in south Archuleta County, Colorado and the Conejos River system to the Brazos headwaters and Rio Nutrias in Rio Arriba County, New Mexico. The membership currently consists of a land block of approximately 200,000 acres but is continually growing and adding members. Elevation ranges from over 12,000 feet and the Continental Divide to around 7,000 feet. The most biologically diverse and ecologically important lands in the west are largely in private hands. The public benefits of conscientious, well-informed management on private lands include clean water, food production, wildlife habitat, soil health and carbon sequestration, jobs and strong economies. The nation’s rural landowners, its farmers, ranchers, and forest owners, provide not only food and fiber for the world, but also a host of environmental benefits, including habitat for wildlife. Nearly two thirds of all species federally listed as threatened or endangered exist on private lands. Conservation efforts on these lands generate outdoor recreation and economic activity that result in sustained growth for local communities and landowners. The 1.4 million acre Alliance region is some of the most spectacular wild country in the Southern Rockies. At its core are private lands bookended by millions of acres of national forest, spanning two states and two sovereign nations – the Jicarilla Apache Nation and the Southern Ute Indian Tribe. As such, the private landowners at the heart of the Alliance region are acting as a catalyst to keep this matrix of private, tribal, and public lands connected, intact, wild, and working. It is a phenomenal model of achieving landscape-scale conservation at a meaningful scale. Read our Stewardship Profile Series for inspiring stories from the people who care for the land. Interested in joining us as a Member or Supporter? The Alliance region encompasses 1.4 million acres in the states of Colorado and New Mexico including the headwaters of the San Juan and Rio Grande rivers with numerous important tributary headwaters. Here, the Continental Divide rises from the arid southwestern desert to create a biologically diverse eco-tone between the Southern Rocky Mountains and the Colorado Plateau. The region is unique because it contains no major urban areas and is still a relatively intact network of private, federal, and tribal lands. The Alliance region is a remote, diverse, and wild piece of the greater San Juan to Rio Grande landscape in southwest Colorado and northern New Mexico. The Alliance region is an extraordinary landscape by any measure. With elevations ranging from 6,000 to 13,000 feet, it is home to recently re-introduced lynx populations, big horn sheep, important populations of native Colorado River and Rio Grande Cutthroat trout, boreal toads, globally rare plant species and vegetative communities, and large populations of black bear, lion, turkey, grouse, deer, elk and many other species. The last known grizzly bear in Colorado was killed here in 1979 and speculation continues as to whether a remnant population still exists in the remote high country. Click on the images below to view maps of the region. This short video highlights one of our founding board members, Betty Shahan, a rancher and advocate for responsible land and water stewardship. This video also features former Executive Director, Monique DiGiorgio, and partners speaking about the impact of the Oso Diversion on the health of the Navajo River and landowner efforts to restore it.